JULIA SPENCER-FLEMING: You know those disclaimers you see in blog reviews? Well, I sort of have one. I gave Deryn Collier's debut mystery, Confined Space, an enthusiastic blurb for its upcoming publication this June. But here's the thing: I wasn't the first in my family to read it. The advance reader's copy arrived, and was sitting on top of the mail. Since Confined Space had been shortlisted for the Arthur Ellis Award, I expected I was going to enjoy it. I picked the ARC up and read the description. "Ooo," I said. "The hero is a veteran of the War in Afghanistan. Cool." Then my husband looked at it. "The heroine works in a BREWERY!" He vanished with the ARC. I didn't see it, or him, for three days. Which leads me to suspect Deryn's combination of veterans, forensics, the beautiful British Columbia scenery and beer is going to make her a very popular author indeed. So sit back, crack open a cold one, and let Deryn tell you why brewing could be very, very bad for your health. A closet crime fiction writer should not work in a brewery. I did, and I can tell you - it’s not a good idea. Do you see what I mean? You don’t? Well, maybe it’s just me then. I read a list like that and I get all excited. To me, each one is a jumping off place for a story. A potential chapter in a book called: How to Die in a Brewery. Take for example Exposure to Carbon Dioxide. This gas is a by-product of the fermentation process. 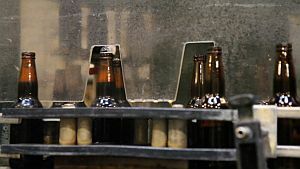 In many breweries it is recovered and stored until it is added back (as bubbles) to the finished beer. But what if the carbon dioxide escapes? Not much of a problem, usually. So long as you are upright, you should be fine. Carbon dioxide is heavier than air. It will sink and disperse, and you will just go about your day. But, say you have a character - say he’s a brewery worker – and he hears a sound. What if he goes to investigate and gets whacked on the back of the head by an unknown antagonist hiding in the brewery? Your character is unconscious on the floor when the CO2 starts to spill out of an open fermentation tank and sink. Remember - CO2 is heavier than air. Your guy is in trouble. Part of my job involved counting beer. Every Friday I would put on my steel-toed shoes (slipping hazards) and my safety eyewear (exploding glass) and my hi-vis vest (collisions with internal transport equipment). I would head down the fermentation hallways and the ageing cellars to take an inventory of beer-in-progress. How high does a fermentation tank have to be in order for a person to die when they fall (or are pushed) from it? How long would a corpse lie on the floor at the back of ageing cellar #8 before it was found? I became fascinated with those places in the brewing process where people interact with machines. There is so much potential for harm. Workers, it seems, remain alive only by the grace of a thousand precautions. The question of carelessness could occupy my mind for whole days: What if someone forgot a step? Rushed through a regulated activity? Didn’t feel like taking a precaution one day? Which exact combination of missed safety measures would it take to build a tragedy? Do you see now why it is a bad idea for a crime writer to work in a brewery? Beer will go uncounted. Spreadsheets will not be properly cross-referenced. The only thing that will come of it is some crazy story. What about you? Have you ever had a job worthy of a crime fiction plot? Please tell me I’m not the only one. 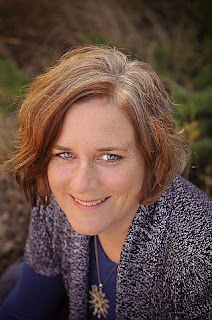 Deryn Collier grew up in Ottawa and Montreal and is a graduate of McGill University. After a very short career as a federal bureaucrat she ran away to the mountains of BC where she has been ever since. She has worked in a log yard, a brewery, as a doctor recruiter and a communications consultant. You can find out more about Deryn and Confined Space at her website. You can also read her blog and follow her on Twitter as @DerynCollier. Excellent! I'm never going to think about breweries the same way again. Welcome, Deryn! I had no idea that breweries were such dangerous places. Isn't it amazing how writing crime novels changes our lives? I'm unconsciously always on the lookout for good places to hide/find a body or ways to kill someone. I suspect it's not healthy! Hi Deryn! 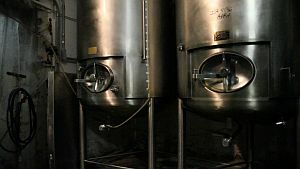 I wrote a book that centered around Scotch distilleries, and I have to admit that things like falling into the fermentation tanks did cross my mind when I was touring distilleries... I ended up using more traditional methods of bumping off my victims--seems a shame, now. I'm not sure about a technical writer/sleuth either...but I do see great potential in a technical writer/criminal. Just think... a misplaced instruction here, a secret message there...and unknown innocents perpetrating crimes at random times and locations. Could be evil and chilling indeed! Thanks Linda! I think that is a favorite pass-time of many crime writers. Tell us - have you found any good possibilities lately? Oooh! Distilleries, now that sounds interesting. I am curious about what qualifies as "more traditional methods"... please do tell! I do love a good beer. More than anything though I have huge respect for beer is made. It is a very old craft and science - one that is being rediscovered. There are some wonderful new craft brews out there these days. Deryn, Kansas City (where I live) is honeycombed with limestone caves, many of which have been developed into business installations and storage because of the constantly maintained temperature and humidity. I've used one of these as a murder scene in my second book, EVERY BROKEN TRUST, which will be out early next year. A huge old hospital that's being torn down is another good site. And a lovely placid bend in a local river that creates a little lake of sorts with herons, sandhill cranes, and various ducks and geese. It's a favorite meditation spot, but that very peace makes it perfect for a corpse discovery. Linda, those limestone caves sound amazing! Just the kind of place to put a crime writer's imagination into overdrive. I'm trying to picture what that would be like - guess I'll just read your book to find out! Welcome, Deryn from an east-coast Canadian! I once did a tour of an old chocolate factory and I think it had some sinister possibilities, not to mention some great places to hide a body. Thanks for "popping" in Deryn! We're fascinated by your book trailer. Did you put that together yourself? Was it your publisher's idea? Was it costly? In Canadian dollars? Excelsior! Thanks for asking, Reds! I collaborated with a friend who is an emerging film maker for the trailer. Cost? Well, we did a good old fashioned trade. She needed some writing done, I needed a trailer...match made in heaven! Yes, I see that you understand! Factories of all kind hold so much...potential, don't you agree? So many hiding places. East coast-er are you? Of course, out here when we say "back east" we are talking about Manitoba. Thanks Reds for another new author to investigate. Why are Julia Spencer-Fleming's link taking me to a strange place?